Who am I and What do I want? I am attracted to the understanding, and appreciation of the art of human circumstances, challenge and situation, to imagine the likely configuration, components and cultured composition, in order to explore their possible beauties, and to discover composure and posture for a desirable and beautiful outcome. How do I do this? We are able to do this through my listening to you. My attention will empower you and encourage you to feel safe and able to say how you feel. You may also be able to describe your circumstance, the difficult areas and what you think makes them difficult. You may also not be able to do this. But because you are talking and I am listening, we will likely see the knots untie or how they were tied and what could be the position we will take to encourage things to shift towards our goal. Why do I do this? I am not exactly able to say why, but I like it and have always found energy to do it when it comes my way. I also enjoy it when my friends stop calling and call back sometimes to talk about another issue or call to apologize for not calling more frequently as before. I am continuously happy because they are now able to be happy. It is a painting completed, rather a masterpiece restored, making our world richer by the brush stroke of one human life. Posted on February 24, 2015 April 17, 2015 by chintualeonard	This entry was posted in Life Stories. Bookmark the permalink. Thanks Gabby. 52 to 53 years is a lot of time to take stock. Through these years I have remembered you and others who came into my life and flowered it which such beautiful petals. 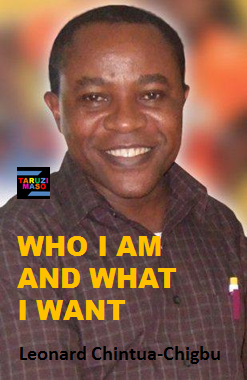 I have understood who I am and what I am to my fellow human beings and beyond. Thank you so much. I will read your blog, and am already feeling good, knowing the extra value it will add to my life. ‘talk to you latter.